Until last week I had only ever attended one piano pedagogy (teaching) conference, and had never participated in such an event; so it was with a spirit of adventure (as well as slight trepidation) that I ventured into the unknown. 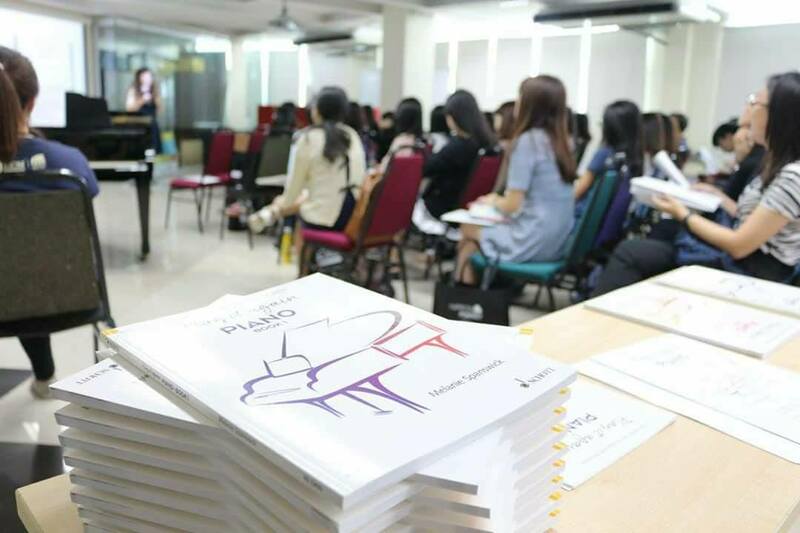 After a successful trip to the Far East over the Summer (where I gave three weeks of classes, lectures and workshops), I was invited to present at the UCSI University Piano Pedagogy Conference 2017, in Kuala Lumpur (Malaysia). It was an offer I couldn’t refuse; I’m accustomed to travelling around the world alone (having done so for years as a young pianist), and find the challenge of working in exotic places simply irresistible. Piano pedagogy conferences appear the world over (with arguably the most well-known being held in the USA and Australia). The UK equivalent is organised by EPTA (European Piano Teachers Association) and is usually a three-day marathon. Most conferences offer a continuous stream of master classes, workshops, lectures, recitals and presentations given by various expert pedagogues, with the aim of inspiring teachers and students. By all accounts, they can be somewhat dull, dry affairs (or so I’ve often heard), where groups of teachers might congregate to discuss the benefits of the five-finger position (or not, as seems to be the case these days if you read the raft of comments on the various online piano teaching forums!). Luckily, I have found students and teachers in Malaysia in particular, more open to different ideas and teaching practices. This was bourne out during my Summer trip, where learning and sharing were the order of the day everywhere I worked. The UCSI University is often considered the number one higher education institute in Malaysia, in terms of music; its Institute of Music is very active, offering its student body recitals, master classes and prominent Malaysian teachers. 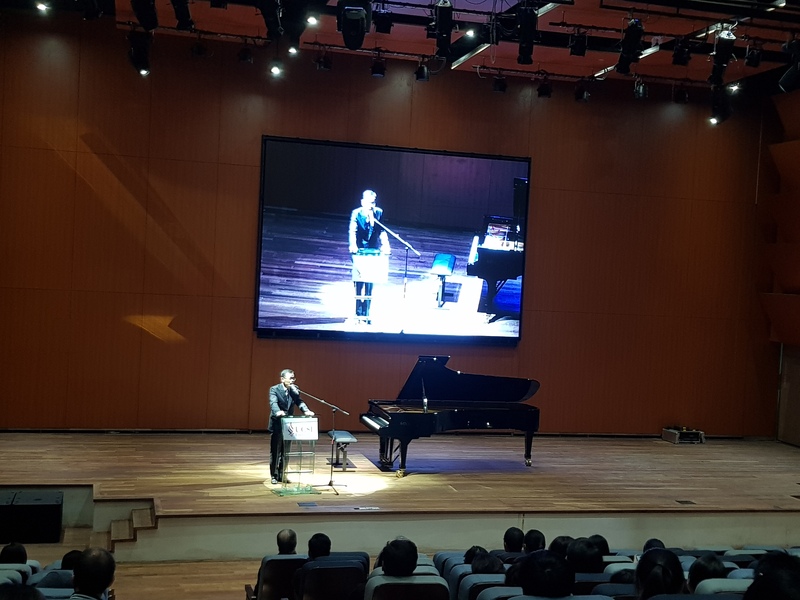 Headed by Dr. P’ng Tean Hwa (who runs the department; pictured above, closing the conference in the concert hall), the institute is thriving, with a new concert hall and music building (which had opened only the day before the conference). Assistant Professor Dr. Christine Tan and her team of organisers had paid meticulous attention to every detail, so that both presenter and participator should want for nothing. I stayed in the hotel at the campus; which, rather like the concert hall, had only opened very recently. This was the university’s first piano pedagogy conference and it featured two action packed days (6th and 7th November). Conference attendees consisted of a mix of teachers and students. The students were primarily drawn from those studying at the university (fortuitous students indeed; I don’t remember anything of this nature being held at the Royal College of Music during my student days), and the teachers were largely local, although there were some from Indonesia and other nearby countries. The key-note speaker, Professor Dr. Michael Campbell, gave a series of master classes and workshops, including an interesting improvisation lecture, where four students (using two pianos) experimented with ‘group’ improvisation. Dr. Campbell closed the conference with a recital which encompassed a large selection of styles and genres; from Scarlatti and Mendelssohn to Bartók and Fats Waller. The Plenary speaker, jazz pianist Michael Veerapen, is a renowned figure in the Malaysian jazz scene. Michael gave a master class, several lectures and a jazz concert complete with band. Both speakers also took part in a pre-conference event the day before (5th November), offering further workshops on their specific specialties. Sandwiched in between the keynote speakers were a group of presenters, including myself. Each presentation lasted 35 – 40 minutes, with a brief Q&A at the end. We spoke on an extensive selection of topics, and those I attended were fascinating. Musicologists picked subjects close to their heart, like Decoding Idiosyncratic Hairpins of Schubert, Chopin and Brahms—Dynamics or Rubato? 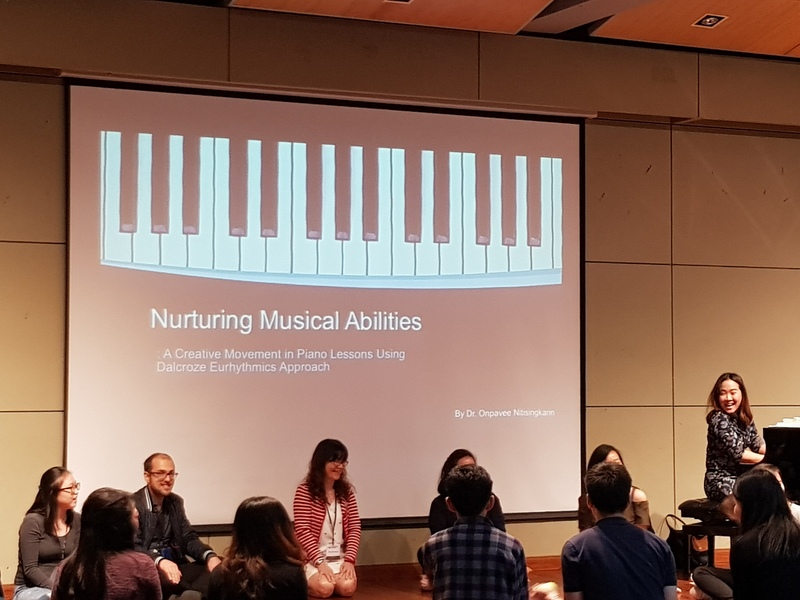 (given by Dr. Cheong Yew Choong) and then there were the practical workshops, which sometimes required audience participation, such as Nurturing Musical Abilities: A Creative Movement in Piano Lessons Using Dalcroze Eurhythmics Approach (given by Dr. Onpavee Nitisingkarin; pictured at the piano (above) with a keen group of conference attendees). Austrian pianist Dr. Andreas Eggertsberger’s lecture was very informative, focusing on a much debated issue, Focal Dystonia. The talk, entitled Focal Dystonia: My Experience with the Injury, highlighted this debilitating physical problem of which many are not even aware. Focal Dystonia is, by all accounts, similar to repetitive strain injury or tendonitis. Dr. Eggertsberger carefully plotted his story, illustrating how he managed to find his way back to relative health, demonstrating the patience and resilience required to ‘re-learn’ to play by acquiring a more secure, solid technique (technical issues are frequently the cause of physical injury). 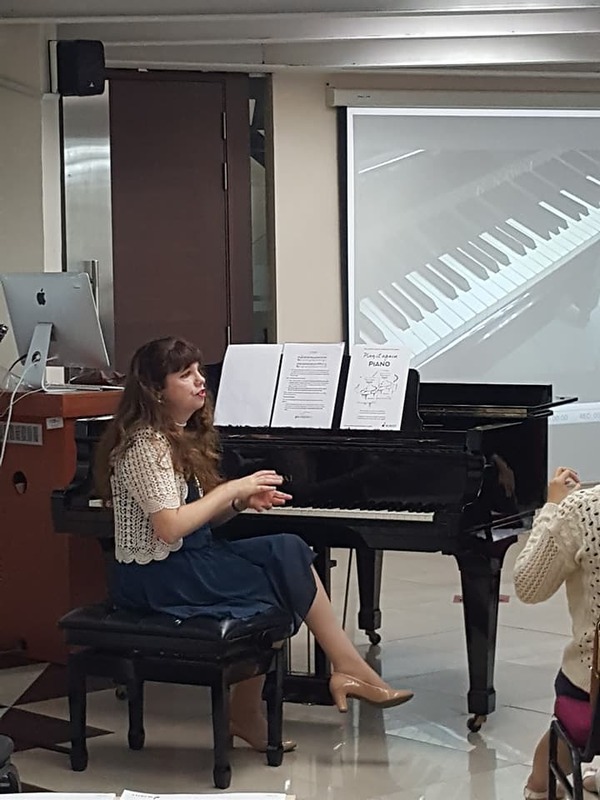 I felt fortunate to be able to talk about my new piano course, Play it again: PIANO (it’s often deemed inappropriate to openly ‘advertise’ your own publications at conferences, but such rigid views aren’t upheld in this part of the world). My presentation (pictured to the right), entitled Developing an Effective Programme for Those Returning to Piano Playing, touched on the need for this student demographic to have a progressive, graded collection of pedagogically sound pieces, with plenty of technical help, enabling them to easily re-acquaint themselves with the instrument. My lecture was indeed popular (with around 75 in the audience; as seen in the photo below) and a fair few books were sold too. We were treated to a splendid array of culinary delights over the two days, with a variety of tasty Malaysian dishes, all included as part of the conference. During these extended breaks, teachers and students could mingle, network and discuss the pleasures and perils of piano teaching. There was also an opportunity to purchase piano music, piano memberships and the instruments too, courtesy of a trade floor in the basement of the building. I really enjoyed making new friends and acquaintances, and found the whole event a stimulating, worthwhile learning experience. I hope to attend many more piano pedagogy conferences in the future.